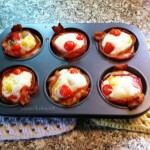 If you do a Google search on Bacon-and-Egg Cups, you’ll get lots of results, including a couple of mouth-watering YouTube videos. I’ll cover the basics here, but the possibilities are wide open. This morning, I kept it simple. 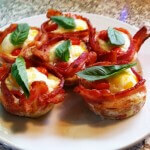 Bacon, eggs, shredded Parmesan-Romano-Mozzarella blend cheese, cherry tomatoes, and fresh basil for an Italian flair. You could also go with fresh chopped jalapenos, cheddar and a touch of salsa, or goat cheese with a fresh chopped garnish of cucumber after baking. Whatever you like, really. The bottom line is this is super easy. First you cook the bacon. You want it just at the point where it’s starting to crisp but is still bendy. Take off the heat and cool on a paper-towel. 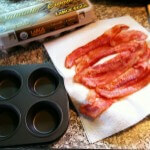 Once you can comfortably touch it, form the bacon cups in a muffin pan. I use half a slice of bacon for the bottom, folded up the sides, and a full slice wrapped around the circumference. Next I put just a sprinkle of grated cheese in the bottom of the cups, plus a few shreds of fresh basil. But you can put whatever sounds good to you. Then I add the egg, one to each cup. Add fresh-ground pepper if you like, or simply top with more cheese. I added the cherry tomatoes next, one for each cup cut in half. Now you bake at 375°F for 15 minutes. Or, if you want the yolk to be a little runny, take out after 12 minutes. 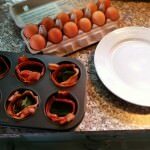 Carefully lift from the muffin pan, garnish with a sprig of fresh herb or basil leaf, and devour. Cook the bacon until it is just starting to crisp, but is still bendy. 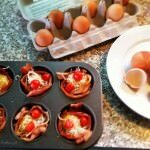 Put the bacon in the cups of a muffin pan. Add eggs, cheese, herbs, or whatever else sounds good. Serve with a fresh sprig of herb. You just made this nice Jewish girl a very happy person. Yum and thank you! *drools* Well, we’re adding this to the list of things I need to make. Holy hell. I’m on your back porch right now. Please let me in so I can taste this! Too late. But the poodle has offered to comfort you with dog kissing.